Comedonal acne is a kind of mild acne. Comedones are the skin colored small papules (bumps) that usually develop on the forehead, nose or chin of those who have acne prone skin. They occur below the skin surface. A comedo occurs when the hair follicle just beneath the skin gets clogged with dirt, bacteria, dead skin cells and hair leading to blockage of skin pores. When the follicle is completely blocked and the comedone remains covered with skin, the comedone is termed as whitehead. Whiteheads characteristically don’t break through the skin, but nudge up the surface with an inflamed bump normally filled with pus. On the other hand if the surface of the comedo remains open and protrudes as a dark color (blackish), it is called a blackhead. Most cases of comedonal acne develop in teenagers and young adults, and these can normally be treated with traditional topical creams and gels. Here are the comedones treatment steps that you need to follow. These comedonal acne treatment steps are applicable for closed comedones treatment as well as open comedones, whether on nose, forehead, chin or elsewhere. 1. If you have acne comedones, use oil-free cosmetics. It is best to avoid smoking and choose a diet that is low in sugar, fat and dairy products. 2. Wash your face not more than twice a day as frequent washing can irritate your skin and trigger more breakouts. Use lukewarm water and gently rub a mild cleanser on your face with your fingertips in the morning and at night. Also, rinse skin with a mild cleanser after exercising to remove bacteria and sweat. Our facial skin is more acidic than water. So if you use a harsh alkaline soap or excessively acidic cleanser, you will harm your skin. Choose mild facial cleansers, which have a pH of about 4 to 5.5. This is the ideal pH for a glowing skin. 3. Try to exfoliate your skin every alternate day. Without exfoliation, excess oil and dead skin cells can block your skin pores. Especially when you have comedonal acne prone skin, you should include this step in your skin care regimen. You can use either homemade scrubs or chemical scrubs containing alpha and beta hydroxyl acids. 4. Excessive oily skin is prone to acne breakouts. Keep facial blotting papers with you to absorb extra sebum (oil) off your skin during the day. Avoid washing your skin frequently during the day, since this can cause your skin to go over-drive to produce more oil. 6. Even if you have oily skin, an acne prone skin needs moisture. But avoid using thick, heavy creams. Best is to use light water-based moisturizers. You can use natural aloe vera gel as it not only moisturizes the skin, it helps healing blemished skin as well. 7. Choose sunscreen and cosmetics that are oil free. Even use hair products such as gel that are oil-free to prevent clogging of skin pores. Go for products that are labeled as noncomedogenic or nonacnegenic as they are safe to use on acne-prone skin. 8. Sometimes comedonal acne behaves like bad guys. No matter how much exfoliation you do, they refuse to come to the surface. This is when one may consider extracting them. It should be done very carefully at home or by a dermatologist or an aesthetician. 9. Consider using chemical peel. Although, it might sound scary to you but it may be an option for treating stubborn comedones. While you apply it topically, it burns off the upper layers of your skin. However, you may look red for a few days. Once your skin peels, you will be having smooth and glowing skin. Follow the directions strictly that are given on the product label. 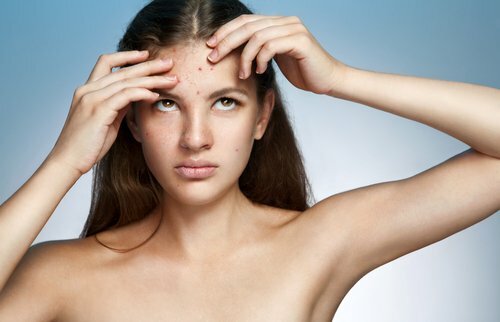 If the above comedonal acne treatments do not work, you will need to consult a dermatologist. He or she may prescribe a combination of a topical application for closed comedones or open comedones (as the case may be) with an oral antibiotic, which kills the bacteria that cause inflammation around the blocked pores. The dermatologist will work with you to help choose an appropriate treatment for the comedones that will work best for you. (i) Wear hairstyles that keep your hair off your face, especially if you have oily hair. (ii) Sometimes the cause of acne is due to some allergy to specific foods. Usually such foods can be dairy foods, high glycemic foods such as cookies or sugar snacks. To keep your complexion clear try to include whole foods in your diet. (iii) Open or closed comedonal acne is more common in smokers than in non-smokers. (iv) Mild to moderate acne generally is cleared within 4 to 8 weeks following a proper treatment regimen. Be patient as you continue with the treatment, and then continue the proper skin care regime to prevent further breakouts. I had not heard of comedonal acne before. Very interesting! I read your same comment on atleast 2-3 blogs. Are you paid by CitrusClear to actually promote them or is this a genuine comment? I liked your tips at the very end – simple and practical!